Heat the oil in a pot. Add the onion and garlic and cook at medium heat until the onion is translucent. Add the aji Amarillo and aji panca, mix well and cook for 2 minutes. Add the meat and salt, cook for 5 minutes, stirring now and then. Add the salt, black pepper, oregano and cumin. Cook for 2 minutes. Take the pot out of the stove and let the filling cool down. Mix the flour and salt. Melt the butter in the microwave. Add the melted butter and warm water and mix thoroughly. Roll out the dough into a thin sheet and cut out round disc shapes (you can use round molds or a small plate). You can also make small individual balls with the dough and roll out each ball to a disc shape. 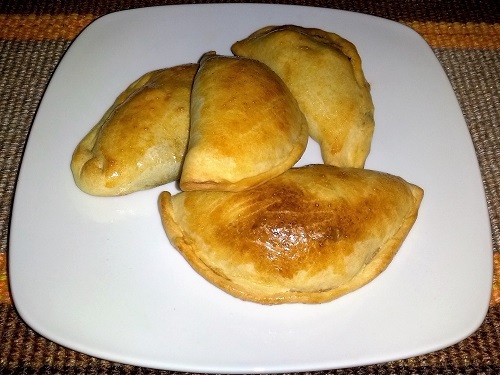 To assemble the empanadas, place a spoonful of the filling on the middle of each disc. Do not overstuff or it will be hard to seal. Add a slice of hard boiled egg and some black olive slices to the filling. To seal the empanadas fold the disc over and then press the edges with your fingers, twist curling the edges little by little, this way you will get semicircle shaped empanadas (a fork to press the edges could also be used to seal the edges). 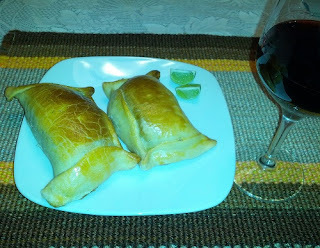 You can also press and fold the edges in three parts, this way you will get rectangle shaped empanadas. 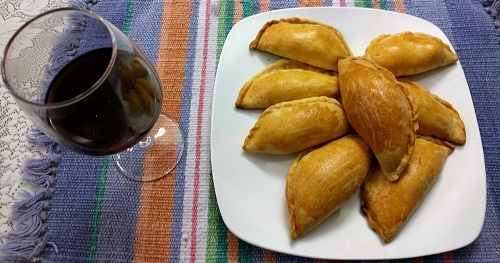 Put the empanadas on a baking sheet with baking paper and brush them with the whisked egg. Pre-heat the oven at 375F. Bake the empanadas for 15-20 minutes, until golden. Serve warm with slices of lime to squeeze on the filling and your favorite hot sauce. They pair very well with red wine.